Britain: Theresa May Survives Key Vote To Delay Brexit - Joe.My.God. 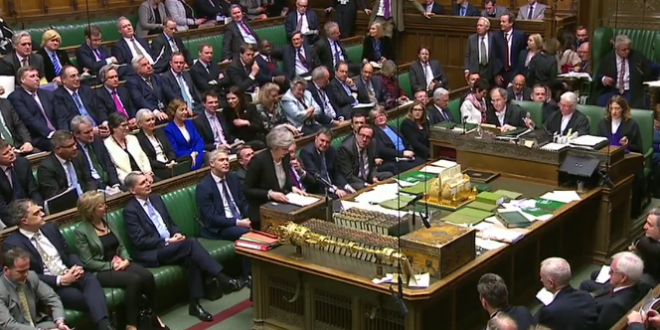 British Prime Minister Theresa May survived a critical vote in Parliament on Tuesday that could have delayed Brexit, undermining her strategy for leaving the European Union and undercutting the country’s constitutional protocol. Mrs. May’s latest political escape came when lawmakers failed, by a 321 to 298 vote, to approve an amendment giving Parliament the power to instruct her to seek a delay to avoid a disorderly, and possibly chaotic, exit that Britain faces on March 29 if there is no agreement. Lawmakers have ordered Theresa May to reopen negotiations with the EU over the Northern Ireland backstop, an insurance policy in the withdrawal deal designed to avoid a hard border with Ireland after Brexit. Hardliners in May’s Conservative Party despise the open-ended nature of the backstop — as it stands now, the UK could theoretically be tied to a customs union with the EU long after the transitional period ends in 2020.